The Cosmosphere, a Smithsonian affiliate, is home to a collection of U.S. space artifacts second only to the Smithsonian’s National Air and Space Museum, and the largest collection of Russian space artifacts outside of Moscow. This unique collection allows the Cosmosphere to tell the story of the Space Race better than any museum in the world while offering fully immersive education experiences that meet the Next Generation Science Standards and introduce students to the power of wondering—asking the critical questions that lead to discovery. At the Cosmosphere, visitors come face-to-face with an actual SR-71 Blackbird Spy Plane, T-38 training jet and scaled Space Shuttle replica. But that’s just the lobby. In the Hall of Space Museum, patrons see three flown U.S. spacecraft, including the Apollo 13 command module Odyssey and Liberty Bell 7 Mercury capsule; one flown Russian Vostok spacecraft; a rare set of Germany’s “Vengeance” weapons – a “buzz bomb” and V-2 ballistic missile; a 109-foot Titan rocket; one of only two Apollo White Rooms; a Moon rock; flown space suits and more. But the Cosmosphere offers more than just entertainment. At the Cargo Bay Gift Store, shoppers find astronaut costumes for kids and adults, astronaut-autographed photographs, retro-inspired space toys, t-shirts, souvenirs and more. Patrons can also eat lunch or just grab a snack at the Lunar Outpost food court. 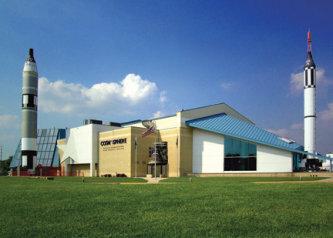 Educating people from around the globe, the Cosmosphere features the Hall of Space Museum, the most significant collection of U.S. and Russian space artifacts in the world; the Justice Planetarium, a dome-shaped theater dedicated to astronomy; Dr. Goddard’s Lab, a live rocket demonstration; the Carey Digital Dome Theater; and summer space camps. It's also a great place for your corporate or family event!